Hire Alexa developers (part-time or full-time) who are masters in working with Amazon skill development using any coding language like node js and python along with tools like Atom. Developers have sound knowledge about features that Amazon Developer console offers the worldwide Alexa developers. Moreover, familiarity with AWS Lambda service is mandate in order to create robust and dynamic Alexa skills. The business analysts, project managers and Alexa developers here are well versed in other AWS services like S3 and CloudWatch as well. Let’s Nurture is the ISO 9001:2015 certified Alexa development company with 3+ years of experience in offering innovative business-driven solutions using Voice enabled technology and devices. Hire Senior Alexa developers who offer end-to-end services, be it creation of intent and slots to invoke an Alexa skill or any lambda function to complete the requested instruction. We do provide all the necessary Amazon Web Services and access to Amazon Developer Console. The unequalled expertise and experience of our Alexa developers assures top-end Amazon Alexa skill development. The variety of skills developed by us, for the smart assistant, back many products from diverse sectors like entertainment, task management, home automation, healthcare/telemedicine and extends much beyond this. Amazon’s Alexa is the AI of choice- be it skills for E-commerce, Content Management, Home Automation or Entertainment. Hire Alexa developers from the best Alexa Development Company in India and gain the benefits of our expertise in AWS like Lambda, CloudWatch and S3. We are a top offshore Alexa development company in India, having offices in USA, Canada, UK, Singapore, and Australia. We aim to give right consultation services to our global clientele to finalize the strategic and logical course for all Alexa skill development projects. Our persistently creative models for Alexa skills compliments and fulfills the motive perfectly. Let’s Nurture also offers staff augmentation services which allows our clients much needed flexibility to hire committed Alexa developers while having control over the Alexa skill development project cycle. Our flexible engagement models also allow us to communicate efficiently with our clients and deliver the Alexa skills in the best way possible. For mobile app development project, Lets Nurture also provide Staff Augmentation Services with total flexibility that compliments our engagement model to hire Android app developers. With staff augmentation services for Android app development project, our purpose is to ensure seamless communication, iterative and Agile development strategies, fast and user-centric app development procedures, provide fitting resources, save time and money on administrative, training and operational costs. Onsite staffing services for dedicated Alexa skill developers to clients and companies within the same geographical border to fill gaps in the development cycle by frequent onsite visits or full-time presence at your place. We offer staffing services for dedicated Alexa skill programmers in countries like US, Canada, India, Singapore, and the Middle East for regular review meetings, system deployment or ongoing IT project development. Hire and employ Alexa skill developers to bring them at our offshore development center (ODC). We have a client-oriented process in which our project managers will keep you in loop in all communication channels with timely reporting. With expertise on node js programming language, Alexa skill developers at Let’s Nurture deliver custom Alexa skills using AWS services and Amazon Developer Console to solve complex tasks with ease. We use Amazon Developer Console to develop and deploy powerful Alexa skill to solve simple to complex smart assistant duties. The range of Alexa skill development services provided by Let’s Nurture is shown below. Hire dedicated Alexa skill developers from a top rated Alexa development company who are skilled to understand diverse business needs and help in offering the best custom-made Alexa skill development services. 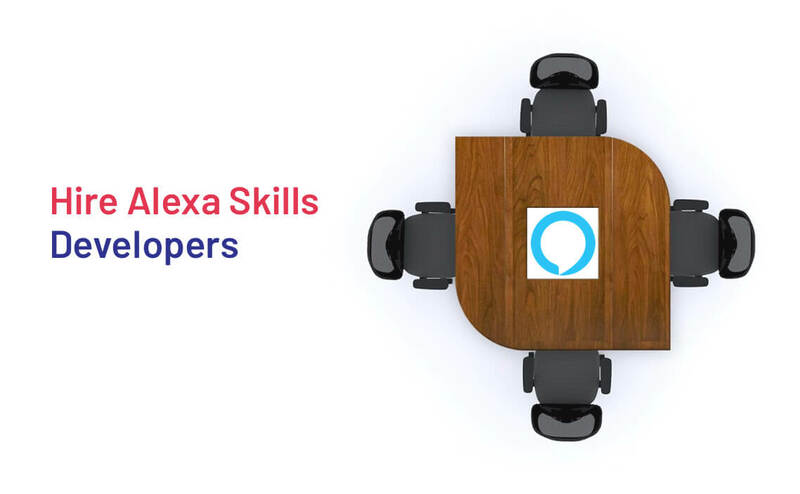 With Amazon Developer Console, AWS Lambda, other tools and frameworks our Alexa skill development team builds dynamic, scalable, robust and secure skills. With best-in-class Alexa development services, we have successfully catered our clients from different industry domains to boost productivity with great ROI. We create high performing E-commerce skills along with e-carts, marketplace solutions, social commerce solutions and more. Our business driven Alexa skill development services help entertainment business to maximize RoI and effectively manage daily services. Our development team has experience in developing on demand training skills and smart assistants for learning using AI like Amazon Alexa. Also, there are some informative fact skills, news updates providing skills and much more like these. We are experts in providing end-to-end Smart Healthcare and Healthcare solutions using multiple technologies like IoT, AI and more. Our innovative IoT based Alexa skills help the automotive sector to be more cost efficient, easy to operate & sustainable for al long run. Our Alexa skills for home automation takes one’s lifestyle to a next level and makes it easier for people to function. Why choose Let’s Nurture to Hire Dedicated Alexa Developers? Hire our senior Alexa developers and settle back as they are skilled in delivering striking Amazon Alexa skills. The tools they use are Amazon Developer Console, AWS Lambda, AWS CloudWatch. Our Alexa programming experts have full-fledged experience in working with frameworks like Atom using distinct packages from libraries like npm and backing up data using tools like AWS S3. Our Alexa developers are well versed working with the latest tools, technologies and frameworks while keeping themselves updated to deliver Amazon Alexa skills with some good standards. Our Alexa experts provide FREE consultation to understand and deliver thoughts before development cycle starts. This is to ensure to deliver right skill as per client needs. No Alexa developer would be assigned without your prior approval. Our flexible engagement models will give you authority to get new skills developed in less time with quick team scaling. We adhere to strict NC/ NDAs for all client projects. Our systems are enabled with advanced security parameters with CCTV surveillance to secure information of your Alexa skill development project. We provide end-to-end Alexa skill development services regarding consulting, strategic development and UI/UX design, Alexa skill testing, delivery and deployment. Have an idea to make your voice assistant do something amazingly good? Let us build awesomeness together! How can Alexa skill add more value to my business? User interaction has evolved with every decade and now it’s shifting from screens on our smartphone to the voice assistants. And Alexa is the best voice enabled service provider that’ll attract many users towards your business and is economical as well. What steps should I take to hire a dedicated/part - time Alexa developer from you? Firstly, list out all your requirements which you expect to be completed by the team. Based on the chosen developer and the architecture of the Alexa skill finalize the agreement with sales team. Would I have the complete control over Project Development Cycle if I hire Alexa skill development team? Our flexible engagement models will give you complete authority over the project development cycle as well as reporting. You will be given regular updates to make decision with utmost transparency and co-ordination of our Project Managers along with development team will be there whenever you want. Our engagement models can suit businesses of any kind, ranging from startups to enterprises. What if I am unsatisfied with the Alexa skill development team’s performance? Will the team be replaced if my expectations aren’t met? What is the way to supervise and communicate the development of the Alexa skill with the hired Alexa developer? We provide reporting on daily, weekly, biweekly or monthly basis and update progress report on shared account on platforms like Zoho, JIRA, Slack and Skype.